The Lord of Love Endowment Fund provides an ongoing source of funding for Mission related projects. The fund proceeds cannot be used for any general fund expenditures of Lord of Love. A committee of five congregation members manages the fund. The Pastor and an appointed council member advise the committee. Each year three to five percent of the total fund assets (as of September 30th) are available for distribution. The value of the fund may not be reduced below $50,000 in any one year. Donations to this fund can be made at any time. Please consider a gift to the Endowment Fund. These can be in the form of second mile gifts, in memory of a loved one, in honor of a special person, or as part of your estate planning. As the principle of the fund continues to grow, it benefits more and more people who are in need every year. The Lord of Love Endowment Fund provides an ongoing source of funding for Mission related projects. Annually local, regional, and global mission projects receive awarded funds based on a Grant Request application process. $500 – Faith Partners Substance Abuse – A new program designed to help congregations deal with substance abuse. $500 – Followers of Christ Prison Ministries – Followers of Christ is a worshiping community established within the walls of the Nebraska State Penitentiary in Lincoln. $500 – Lutheran Campus Ministry – Provides ministry to college-aged students in the Omaha area. $500 – Lutheran Service Corps – Provides support for five full-time volunteers for a year of service in the Omaha area. $400 – ESL Students – Supports teacher-provided snacks for ESL students in their after-school classes. $1,150 – Nebraska Lutheran Outdoor Ministries – Provides support for camp counselors at Camp Carol Joy Holling. • $1,000 – Scholarship Fund – Provides scholarships for nursing students in Tanzania. • $300 – Poor Persons Orthopedic fund – Provides funds for individuals that cannot completely pay for their surgery. Here are some ways that our past endowment fund grants have made a big difference. This program connects college students with churches in the Omaha area. Three solid ministry cell groups exist: God & Grads, a weekly ministry engaging twelve graduate students; NeMO, engaging 35 undergraduate students from various colleges in the area; T-GAP, a weekly ministry aimed at College of St. Mary students. These three ministries are currently engaging more students than at any time in NLCM 35-year history. Seed money from the Lord of Love Missions Possible team helped launch a program where inmates package meals for distribution to the hungry in rural Nebraska. This grant helped support expansion and continuation of this mission and ministry. Supports scholarships for Nursing or Clinical Officer students. $750 supports one student for one semester. Ramadhani Ally Karia is the nursing student Lord of Love sponsored for a semester and a half through the endowment fund. Rhamadhani beginning his first year in 2016. September 1, 2018 was Graduation Day in Machame. Rhamadhani was one of 45 nurses and 74 clinical officers who graduated.of the Nursing Certificate course. Rhamadhani will go on to touch thousands of patients and families during his career. Through our scholarship support we are touching thousands of lives in Africa as well. Ramadhani’s letter of thanks tells more about him, his family, and his dream to become a nurse. Purchased replacement computers for the hospital finance department. Each computer cost about about $600. In 2015 we awarded $1000 to this fund. Two stories about surgeries supported by the fund showed the impact of this fund on the well-being of the affected children. Annual grants have continued to support this fund. Sindio Anthoni is 26 years old and lives deep in the bush in Tanzania in a village area called Loliondo. 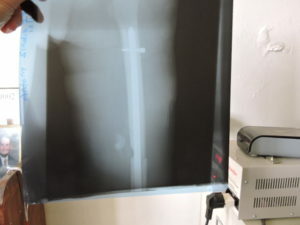 He broke his femur (thigh bone) in a fall and it was not healing. 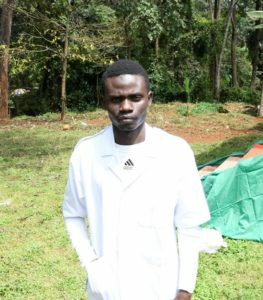 Sindio came to Machame Hospital to look for help. At Machame Hospital they put him in traction for a period. Once things straightened out they surgically inserted a long metal nail (about one foot long by half an inch in diameter) in the center of the bones to connect and hold them properly in place. One need not be a physician to understand the before and after x-rays. Sindio is now able to stand and walk and even squat a bit. Sindio was at Machame Hospital for about 4 months and his bill was 1.2 Million (luckily in Shilingi, $558 US dollars). His family and community were able to pay about $350. The poor person orthopedic fund supported by a grant from the Lord of Love Endowment Fund paid the remainder of the bill allowing Sindio to be discharged. This is one example of how Lord of Love’s gifts make possible the important work being done at Machame Hospital. 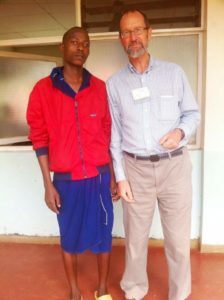 In December 2015 the Endowment Fund gave a grant of $1,000 to the Machame Hospital, an orthopedic hospital in Tanzania. The grant provides help for patients with serious orthopedic problems and depleted resources. In the instance below, the grant helped for care and surgery of Majidi, a young needy patient. The grant enables the hospital to continue to serve other patients needs as well. ber 2015. He does not seem to have a family. Fortunately, other patient’s families were sharing their food with him. 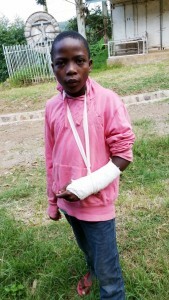 Majidi fell from a tree and suffered several arm fractures. 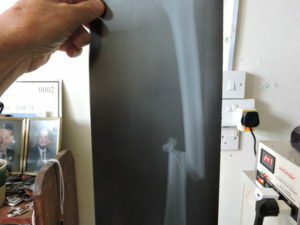 He had a fracture of his wrist and an open fracture near the elbow with his bones sticking through skin. First they treated his wounds so they would heal sufficiently to allow surgery. 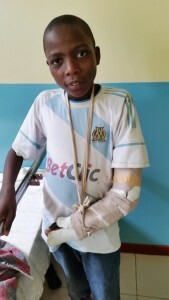 At the end of January 2016 doctors performed a closed reduction to align his bones at the fracture site. Next a plaster cast was put on his arm. Overall, this surgery and treatment encourages functionality and prevents deformity. – Enabled two Tanzanian students to attend secondary school through partial payment of their tuition. The students were Reginald Stephano Mwanga and Marta Onesmno Mkumo. – Partial tuition for seminary school. – Covered the cost of books and other college expenses allowing the recipient to work as a counselor at Camp Carol Joy Holling. – Provided scholarships for low income children attending the Day Camp Program provided by Nebraska Lutheran Outdoor Ministries. – Various forms of assistance to people in Tanzania as identified by Lord of Love members traveling to Tanzania.